Basingstoke and Deane Sport and Physical Activity Alliance (SPAA) is a network of partner organisations who share a common aim of increasing the number of people within the borough participating in sport and physical activity. Who is involved, and what current opportunities are available? identify shared local priorities and appropriate initiatives to increase the number of people participating in sport and physical activity. Organisations with a direct interest in sport and physical activity within Basingstoke and Deane as well as those who have an interest in the benefits and broader social outcomes. We organise free and low cost opportunities including health walks, free swimming for over 55’s and many more opportunities. The council offer bursaries for those wishing to undertake sports coaching courses. Basingstoke and Deane Health and Wellbeing Partnership shared plan - A voluntary network of organisations seeking to improve health outcomes for the population of the borough through local leadership and influence. 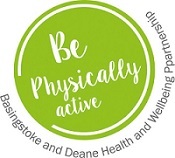 The plan has four key outcomes, with the co-ordination of the ‘Be Physically Active’ strand the responsibility of Basingstoke and Deane Get Active, with the desired outcome to increase rates of physical activity in the borough, and decrease the rate of inactivity. Energise Me exist to beat inactivity and are committed to unlocking opportunities for people of all ages to beat inactivity for life. Energise Me are the County Sports Partnership in Hampshire and belong to a national network of County Sports Partnerships that specialize in delivering national reach and local impact, and are committed to unlocking opportunities for people of all ages to beat inactivity for life. Testbourne Leisure and Learning Centre is part of Testbourne Community School. The Community Office run a busy programme of courses, clubs and activities, fitness gym and classes ranging from Brownies to Bendy Bears and Ballroom Dancing. A vast range of indoor and outdoor facilities are available to hire including a sports hall, theatre hall, sports pitches and swimming pool. The Hurst Community School – The Hurst Leisure and Learning Centre host adult education courses and have a vast range of first class facilities available to everyone, including Woodlands Gym and a weekly programme of fitness classes, for use by the local and wider community. The Vyne Community School has a wide range of facilities and a diverse range of classes and groups that meet at the Vyne. Sports facilities available to hire include a sports hall (4 x badminton court), large playing fields, and newly resurfaced hard courts. Basingstoke Sports Council (BSC) is a voluntary sporting organisation with committee members representing the major sports in the area. BSC works 'with and for the local sports community' alongside a variety of partners and primarily the Borough Council. Its two major events being the prestigious annual Sports Awards plus annual Festival of Sport with German twin town Euskirchen. A wide range of sporting issues are discussed at regular meetings. Basingstoke Voluntary Action (BVA) – whether you are a charitable, voluntary or community group looking for help and advice, or a resident wanting information on community services, charities or activities, you can find all the help and advice you need at BVA. Our comprehensive database and website provides useful guidance and contact information for a wide range of organisations and services to assist groups and individual members of the Basingstoke and Deane community. sand-based astro pitch and 3G football pitch. Basingstoke College of Technology (BCoT) is a dynamic college with industry-standard facilities in a large campus in Basingstoke and a new training centre in nearby Bordon. The College offers advanced technical, vocational and academic qualifications that help our students go onto university, higher training or work. Basingstoke School Games Organiser – the role of the School Games Organiser is to drive participation in school games competitions and increase the number of young people taking part in inter school sport competitions. This includes competitive opportunities for all, including the least active. The vision of the North Hampshire Clinical Commissioning Group is to make a positive difference to the health and wellbeing of our population by delivering excellent patient experience and clinical outcomes, and to see a better integrated health and social care system for the future. West Hampshire Clinical Commissioning Group - GPs in west Hampshire are supporting a campaign to get people walking more . Physical activity has a positive impact on health and happiness and even small changes can make a big difference. Sitting for long periods of time can cause premature aging and diseases such as cancer, heart disease, diabetes, dementia and depression. The only thing that can prevent this damage is being more active!